La Fortaleza, or the Fortress, as well as being known as the Palacio de Santa Catalina is the official residence of the governor of Puerto Rico, constructed between 1533 and 1540, to defend the harbor of San Juan and is the oldest executive mansion in the New World, listed by UNESCO in 1983 as part of the World Heritage Site, "La Forteza and San Juan National Historic Site. The Chapel of Santa Catalina would be incorporated into the walls of the building during a 1640 reconstruction, that had been originally located outside the walls and then demolished to be moved; and that caused it to become Santa Catalina's palace. It was the first defensive fort constructed for the city, and become the first in a series of military structures that would be built to protect the city that included the Fort San Felipe del Morro and Fort San Cristobel. It was authorized by Charles V, the Holy Roman emperor, to be used for defense against the Carib Indians and the other European nations that sailed the Caribbean. Originally, it would have four walls that encompassed an interior patio with a marvelous circular tower that became known as the Homage Tower. From its summit, the governor, following a military tradition, would take oaths of fidelity to the king and queen of Spain; and later a second tower would be built and named the Austral Tower. Today, that former complex includes a number of attached structures with formal living quarters on the second floor and private quarters on the third. It looks out over the high city walls that face the bay and on the north perimeter of the house there are sheltered gardens and an excellent pool. In 1960, it would be named a United States National Historic Landmark. 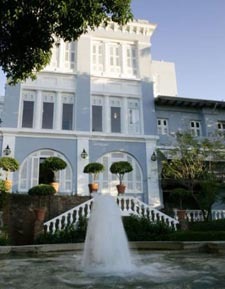 This is one of the most prestigious museums in the nation, occupying a 130,000 square foot neoclassical structure that was built in the 1920s and originally called the San Juan Municipal Hospital and today is one of the biggest museums in the Caribbean and houses a magnificent collection from the 17th century. A new east wing has been constructed, with a beautiful five story tall stained glass window that is the creation of local artist, Eric Tabales. It is located in the heart of Santurce, just a few moments from the Luis A. Ferre Performing Arts Center and the Puerto Rico Museum of Contemporary Art. The original house was designed by architect, William Shimmelphening, and the new wing was designed by architects Luis Gutierrez and Otto Reyes in 1996, attached the original structure that is now considered to be complete. There is a magnificent garden filled with a plethora of native flora, a gift and book shop, 400 seat theater, excellent restaurant and huge atrium. 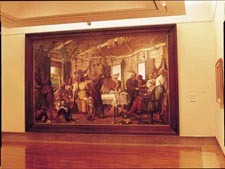 The museum would be started in 2000, amassing a great permanent collection of Puerto Rican artworks from the 16th century to the present day, with the works quite researched and documented so that the exhibits will have some type of interpretation offered so the masterpieces could be interpreted. The Shimmelphening wing is one of the thirteen buildings that had belonged to the hospital and incorporated into the main structure to save the architecture for future generations and education. The museum has five floors that contain two galleries, the theater and a conservation department. Around the museum, there are numerous interactive art exhibits and galleries that provide students and other art lovers to become more involved in the art that encompasses them.